After I finished my shawl, I started knitting a little cardigan for my grandson. I found the pattern in a vintage catalogue from my mother. I already used several patterns from this catalogue for my own children about 35 years ago. I love to knit cable stitch, it's so easy and gives an impressive result. The yarn is baby alpaga. 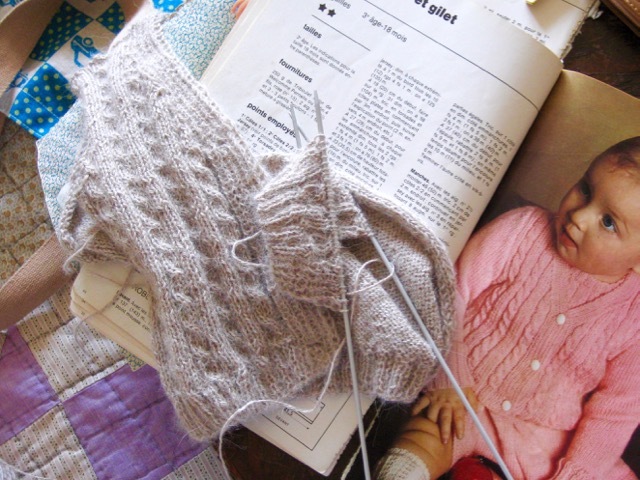 Most of the time I knit very early in the morning together with drinking my tea. 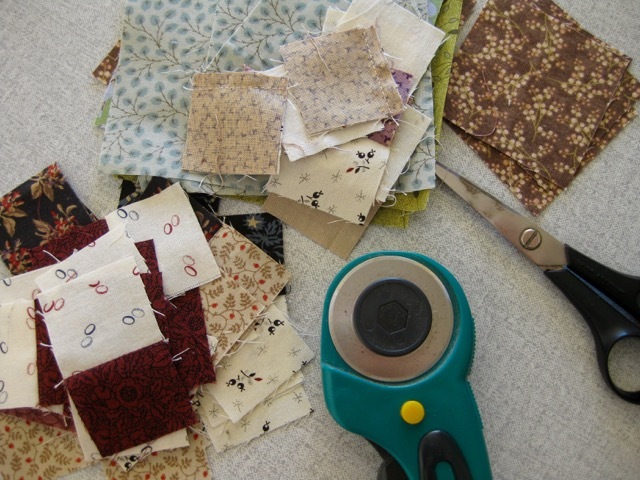 Then comes coffee time and quilting... well, in between a little housework! 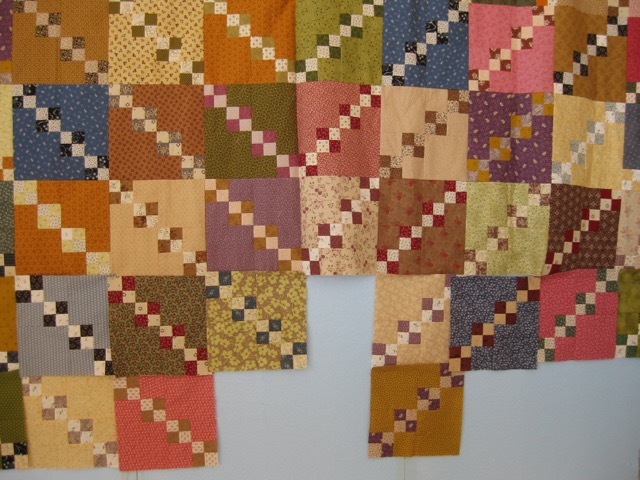 I am finishing the last six blocks of my Double Four Patch top. After this, I will prepare the tutorial as promised! What a nice cardigan you are knitting. Your grandson will look grand in it. Your patchwork is also coming along nicely too. Sweet and nice the cardigan (and color) you've choosen ! La petite veste sera très jolie et ton petit-fils sera bien au chaud avec elle ! Ton patch avance bien....j'aime beaucoup ses couleurs ! The double four-patch is beautiful! Your knitting is beautiful. It sounds like such a nice start to the day. Both projects are gorgeous. I do hope we get to see the cardigan on it's adorable model. The cardigan looks very soft and comfy. :) Love seeing the double four-patch come together. It looks a little time consuming. Such a sweet little cardigan! Very cute and it looks so soft. I wish I had my mother-in-law's old knitting patterns. Your baby cardigan is adorable and the colour yarn is perfect. I like how you plan your day! Your double four patch is looking delightful! i like the movement in your quilt. please link up the finished product!!! Perfect start to the day! I really love baby cabled sweaters. This one will be adorable for your grandson! Sounds like the perfect start to the day. Amazing quilt, very impressive! what a sweet little cardigan!!! what a nice way to spend your day!!!! I love your quilt squares. One of these days I'll learn how to sew! Your cardigan is precious. It looks so delicate! What a cute little sweater! 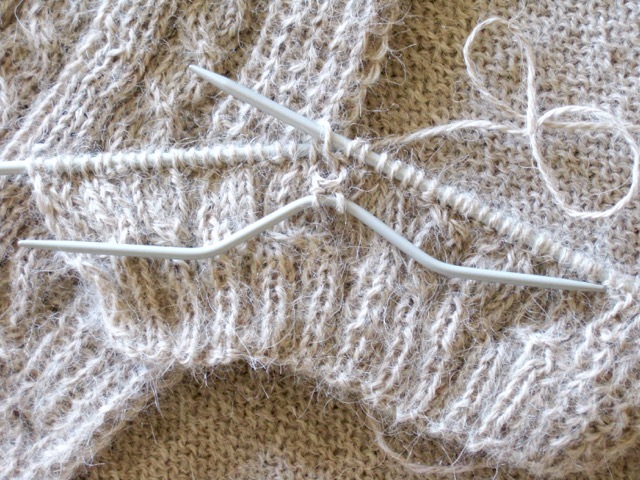 Cables are my favorite thing to knit. I like the sweater, the wool looks super soft. Oh, to have time to knit and quilt! 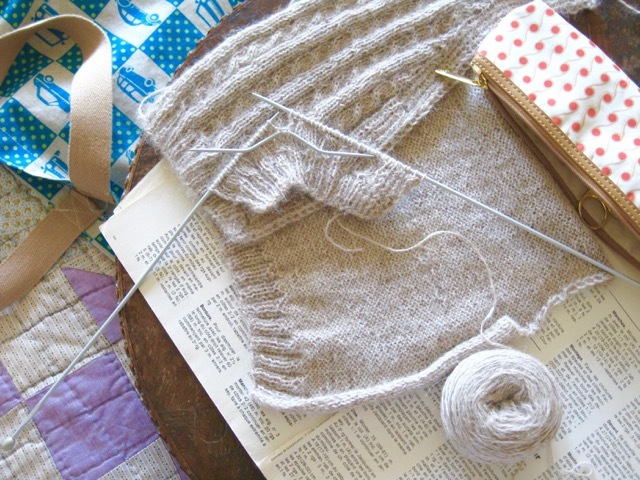 I love what you are working on - the cardi looks so soft and cuddly! The cardigan is lovely. It will be so soft in baby alpaca. I look forward to your tutorial. I really want to learn to quilt.